Oaty Potato Cakes And Smoked Salmon anyone? A match made in heaven! Perfect for a breakfast in bed treat or a lazy mothering Sunday brunch – something the whole family can enjoy. Cook the potatoes in a pan of lightly salted boiling water for 8-10 minutes. Drain well and return to the saucepan and heat for 30-40 seconds to drive off any excess moisture. Allow to cool. Mash the potatoes with half the butter and season to taste with salt and freshly ground black pepper. Stir in the oats and divide the mixture into 4 equal pieces. Shape into 4inch patties. Whisk the eggs and milk together and season with salt and freshly ground black pepper. Add half the remaining butter to a large non-stick frying pan and heat until foaming. Add the potato cakes and fry for 3-4 minutes on each side until golden brown adjusting the heat if necessary so the butter does not brown. Arrange on kitchen paper, cover and keep warm. Wipe out the pan and return to the heat, add the remaining butter and melt. Stir in the egg mixture and cook over a medium heat for 2-3 minutes stirring until creamy and just set. Arrange the potato cakes on individual serving plates (serve both or one on the side instead of toast). Spoon over the scrambled eggs and smoked salmon. Sprinkle over the spring onions and freshly ground black pepper and serve immediately. 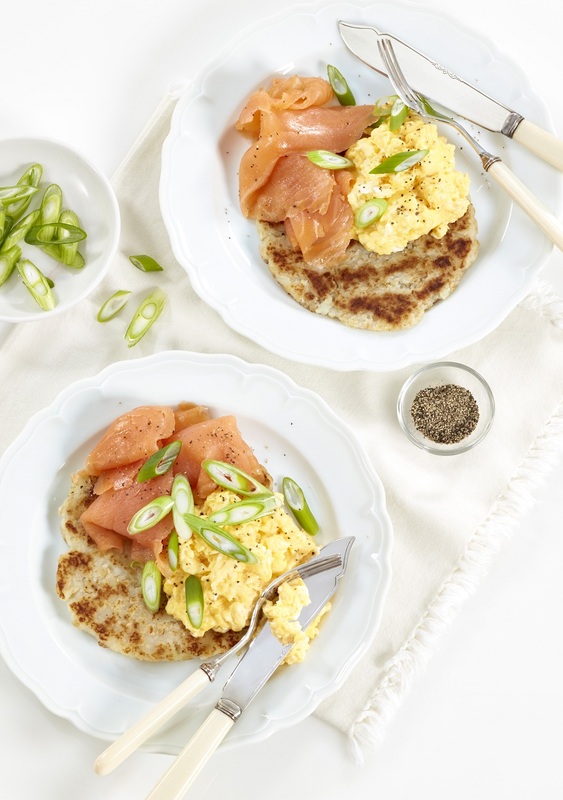 What do you think of this Oaty Potato Cakes And Smoked Salmon Breakfast recipe? Scrambled Eggs With Smoked Salmon Bagels. Salmon With A Pistachio And Basil Crust. Smoked Salmon Carpaccio With Horseradish Cream, Rainbow Beetroot, Radish, Capers and Watercress. Hot-Smoked Salmon and Watercress Salad with Apple, Green Beans and Crème Fraiche. Classy Salmon, Radish And Cheese Crackers. Roast Salmon With Fennel And Pistachio Dukkha. "Overnight Pear And Blueberry Oats For Mothering Day Breakfast"
"How To Make An Apple And Cinnamon Crumble Cake"
How cool to use oats! I make a salmon cake that is so good!